Over the last year I've been amazed how many people are intrigued by Unicorns. I think we can keep them alive n Kicking by believing in them! and of course a poem. For it is a creature of mythical delight. The Unicorn who once stood so proudly. Alas as with so many creatures of old. It has been forever lost to this world. I feel the magic of the beast run in my veins. Run through the forest in my dreams. A place where the enlightened can be free. And the Unicorn can freely graze. Fabulous beast of untamed wildness. An embodiment of noble pride, purity of spirit and mysterious powers. Strangers to mankind, unicorns dwelt far away from humanity. Seeking out mountains, forests, places where magic might still be found. The unicorn would miraculously appear to the purest of heart. In whose presence it would become truly gentle. Only then would it share its magic with these who believed in its glorious power. The last Unicorn: devoted to the book of the same name. The Home of the Unicorns: The unicorn has been a topic of wonder and speculation for centuries. The writings of such men as Aristotle, Genghis Khan, Saint Thomas, and Saint Gregory reflect the fact that these men considered the unicorn as a very real creature. 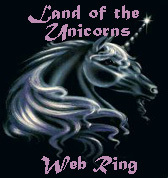 The Unicorns Meadow: Searching for the secrets of the unicorn? Unicorns united - Are you a unicorn? Here's a new picture!! I'm sorry to say that I don't know who the wonderful artist is, except it looks like there's a unicorn running round loose on waiheke Island off the coast Of Auckland New Zealand! Here's The newest addition to my Page, I adopted this gorgeous lil Unicorn from the Creative people at the Unicorn friendship centre. 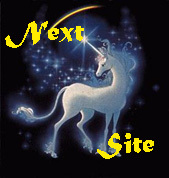 ThisLand of the Unicorns site is owned by Rhiannon.